I suspect, like me, a good few people, coming to Masque’s summer offering, view an evening of this particular Shakespearean tragedy incomplete without men in tights, Holbeinesque women, lots of sword play and cackling hags. After the first few explosions, the appearance of soldiers brandishing Lee Enfields and three very iffy nurses, looking like the brides of Chucky, a quick reassessment of the situation was called for. ‘What bloody man is that?’ asks Duncan. And, from there on, we were off on the unstoppable journey of betrayal, murder, madness and retribution. And lots of blood. To start with, there was a real feeling of anticipation and excitement to the thing, even before the audience got in. The set, an abstract representation of the castle, looked good. Mark Mortimer’s construction was an impressive piece of work and, with action taking place on different levels, worked well and, once we got going, Tamsyn Payne’s influence as Production Designer and Phil Welsh’s sound and lighting artistry, creating the mystical and oppressive atmosphere of unfolding events, all combined to produce a stylish end result. 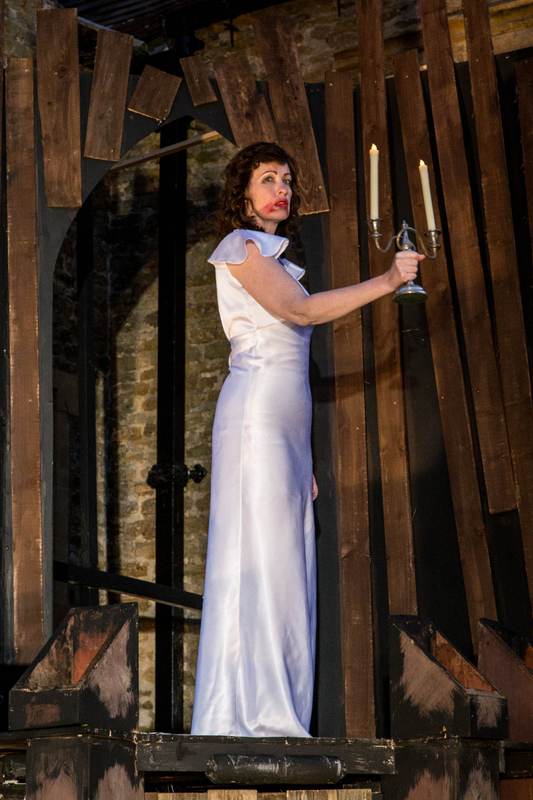 New to Masque, Nicola Osbourne, was Lady Macbeth. Looking every inch the aristocrat, she gave a convincing portrayal of the power behind the man and the decline into madness with Martin Williams, in the title role, giving another polished performance as the insecure and superstitious Thane with a lust for power. John Myhill again came up with a thoughtful and watchable performance as the hapless Banquo with the horrendous laundry problem. Jof Davis and Peter Collins were transformed into the most evil couple of villains you’d ever want to cross to the other side of the street to avoid. Peter, with his hair cut, looked eighteen inches taller. How’d he done that? Lastly, always a joy to watch, Barry Dougall as Seyton the porter. Barry manages to establish a rapport with any audience he has direct contact with; a good choice for a bit of ‘light relief’. Having said that, the show looked what it was – real team effort that paid off. Certainly the punters got their money’s worth and, on the strength of this, from comments received, most of them will be back next year. There was the odd criticism of course. Shakespeare al fresco is not a vehicle for subtlety and there was the odd time when it went a bit quiet when presented with the back of an actor’s head. And it did get a bit nippy after 9 o’clock. All in all a good result not just from the actors but the unsung and unseen behind the scenes as well, with Stage Manager Jo Molyneux with helpers Bernie Wood and Lasma Paberza. Oh, and let me not forget our little band of helpers on Box Office and Refreshments. 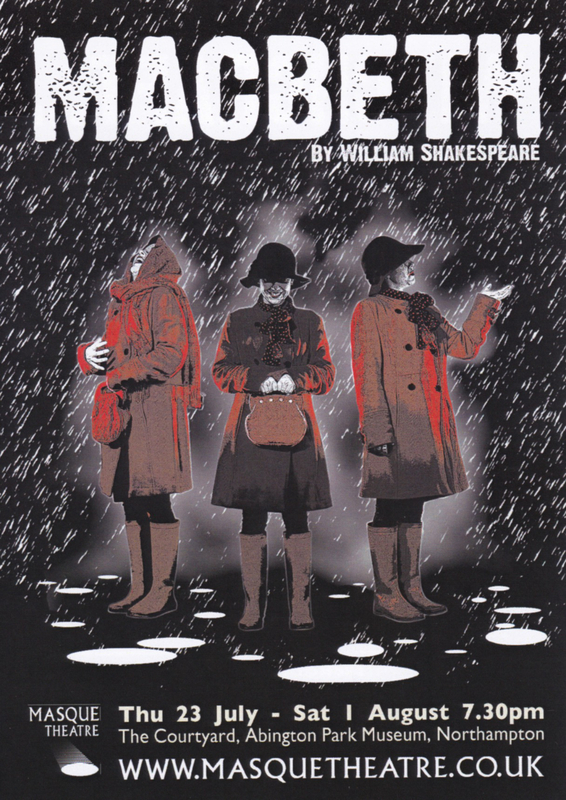 The play Macbeth, with its themes of the supernatural, the elements and its castle setting has been cited as inspiration for the 19th Century Gothic literature movement. It was certainly an influence on myself and the production designer Tamsyn Payne with regards to how we wanted to set and style the piece. There are other influences as well, many of them movie-based, as we wanted to set out to create a piece that genuinely evokes the themes of fear and guilt that permeate through the play along with recognised motifs of blood and ambition. As such, we have been quite radical in some of the revisions of the text as we seek to create a Macbeth that challenges audience perceptions and explores the psychological descent of a man, through both its performances and staging. To that end, the production is blessed to have talent available in terms of both acting and production aspects. Martin Williams plays Macbeth with Masque Theatre newcomer Nicola Osbourne playing Lady Macbeth. Rob Kendall plays Duncan, John Myhill is Banquo, Robin Armstrong is Macduff and Rachel Bedford is Lady Macduff. Another Masque debutant, Christopher Watkins, plays Malcolm with Luke Nunn as Duncan's other son, Donalbain. Barry Dougall is the Doctor, Ed Toone is Ross, Kevin Pinks is Caithness, Jeremy Smith is Menteith, Masque debutant Sam Burridge is Angus, Charlie Clee is Lennox, Victor Guse is Siward, the Three Weyard Sisters are played by Jen Kenny, Lisa Shepherd and Katie Bunting, with Peter Robinson and Jof Davies making up the ensemble. Special thanks to Mark Mortimer who is building the set, also to Philip Welsh for lighting and sound design and to Jo Molyneux (stage manager), Bernie Wood and Lasma Paberza (ASMs) and Susan Dotan for their help in rehearsals. The director, Matthew Fell, has previously directed Much Ado About Nothing (2014), The Hypochondriac (2013), Clear Heels (2013) and Teechers (2012) for Masque Theatre.